"Hard as it is to believe, many in the West simply will not take the time and trouble to understand the threat posed by radical Islamicist terrorism. James Burnham once wrote of a similar problem with international Communism in his masterful Suicide of the West. Now, Jamie Glazov has written this century's counterpart to Burnham's classic work and will doubtless upset those determined not to analyze for themselves the nature of the underlying phenomenon." "I have long argued that the usual likening of evil to darkness may not be nearly as accurate as likening it to bright light. The reason? People can look into the dark, but they cannot look into very bright light. The natural instinct is to look away. The denial of evil is therefore the most dangerous of all the denials in which human beings engage. We saw it during Communism, the most genocidal ideology in history, and we are seeing it today with violent Muslims. What Jamie Glazov does is explain this phenomenon, thereby making Jihadist Psychopath one of the most important books of the present time." "Jamie Glazov's Jihadist Psychopath is one of those truly rare books that is so brilliant and deeply original in its holistic analysis of the emergence of the modern jihadist that it will emerge as one of those books that will change your life forever. This work is steeped in the richness of history, psychology, military conflict, and religion - and exposes the pathological Stockholm Syndrome that the West has developed in the hands of our enemy. 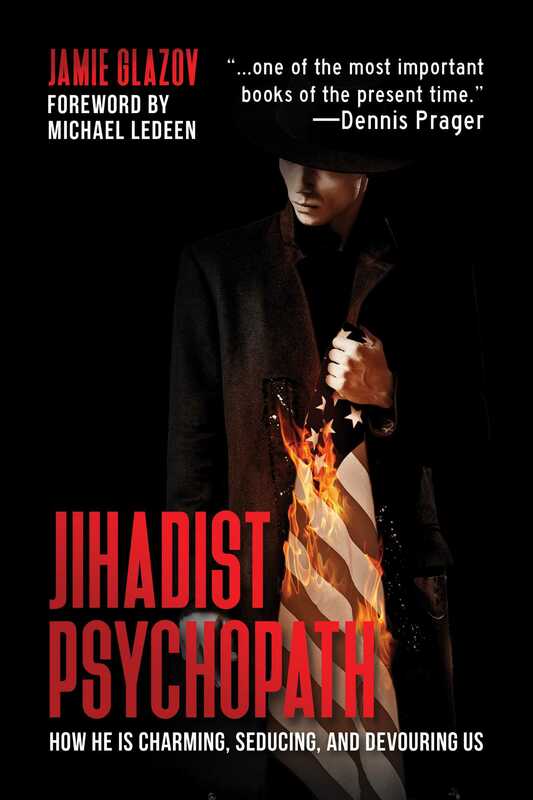 Jihadist Psychopath is destined for permanent greatness for all classes and sectors of society, from the masses of readers of all books to the highest levels of academia to law enforcement to your own family. It will captivate and mesmerize any reader. Failure to read it is not an option." – Steven Emerson, Executive Director of The Investigative Project on Terrorism and author of "American Jihad: The Terrorists Living Among Us"
"Dr. Jamie Glazov is one of the most courageous and perceptive journalists of the free world. In this book, he explains why so many of our leaders in academia, media and politics behave like ostriches when confronted with the dangerous threat of Islamic Jihadism. His book not only analyzes Islam and how it inspires jihadist psychopaths, but it also describes the equally pathological unwillingness of our elites to deal with the danger. Dr. Glazov deserves the highest praise. He not only helps us to see the threat more clearly, but he also encourages all the defenders of freedom and dignity to persevere against the biggest threat humanity is facing today. I hope Jihadist Psychopath finds as many readers as possible." "The peculiar dynamic of our times, of Islamic jihadis killing people, followed by Western authorities defending Islam and increasing measures to grant more concessions to Muslim groups, cannot be fully explained by any counter-terror strategy or geopolitical consideration. In this enlightening and groundbreaking book, Jamie Glazov reaches into the realms of psychopathology to clarify this odd phenomenon and succeeds in shedding light on it where numerous conventional thinkers have failed. This thought-provoking book should be on the desk or nightstand of everyone who wants to change the prevailing dynamic and counter the global jihad effectively." – Robert Spencer, bestselling author of "The Complete Infidel's Guide to the Koran" and "Confessions of an Islamophobe"
"A fascinating and eye-opening political thriller. Glazov's ferocious takedown of the Jihadist Psychopath and his leftist minions reveals, in frightening detail, the menacing monstrosity we are up against. This book is an indispensable masterpiece of the utmost importance in our perilous times." "This is an unusual and invaluable book. It explains why so many in the Western world have been seduced into embracing, or at a minimum fully tolerating, radical Islam. You may have wondered if such people are ignorant of the real content of radical Islam. Jamie Glazov says no, they are not at all ignorant. They have been entranced just as the victims of murderous psychopaths are led to believe that their would-be dominator is actually their best friend. Thus, we are faced with a willful suicide by radical Muslims' intended victims, who are destroyed even as they believe the radicals are the real victims." – Michael Ledeen, co-author of "Field of Fight: How to Win the War Against Radical Islam"
"Most people are terrified of the elephant in the room, but Jamie Glazov courageously charges in after the beast. With his latest book, the author of United in Hate once again explores and explains the psychology and philosophy behind the current events of our struggle with Islamic terror. Jihadist Psychopath is an invaluable lens for understanding not only the enemy, but his appeasers on our own side." – Daniel Greenfield, Shillman Journalism Fellow, author of "The Great Betrayal"
"A crushing blow to a deadly psychopathic mass cult. In Jihadist Psychopath, Jamie Glazov packs a masterful right hook to a modern embodiment of the Black Death. This absolute must-read is the result of solid politological research and highly professional journalism. Its most important and unprecedented contribution: exposing the deep and chilling link between Islam, leftist ideology and crowd psychopathology, all in one vial. A tour de force." "In Jihadist Psychopath, Jamie Glazov unveils a very real and menacing psychological phenomenon, a task to which he brings deep wisdom and broad learning. While drawing extensively on other writers' insights into such topics as white guilt, self-delusion, transference, Stockholm Syndrome, con artists and their dupes, and (especially) the psychopathic mind, he has produced a remarkably original work - a book that makes an illuminating and highly valuable contribution to the contemporary literature of Islam and the West." – Bruce Bawer, author of "While Europe Slept" and "Surrender"
"Dr. Jamie Glazov's Jihadist Psychopath unveils the self-destructive relationship we blindly submit to with our Islamic enemies in the hope that it will stop their advances. As this book masterfully elucidates, such submission only further cements our ultimate downfall. Only by understanding the dynamics (the techniques of our enemy and our psychological tendencies in response) so skillfully described in this work can we find a pathway to reverse course. This is a brilliant must-read - as one will be unable to blind him or herself to the reality of this relationship ever again. Bravo Jamie Glazov!" – Bill Siegel, author of "The Control Factor: Our Struggle to See the True Threat"
"According to the famous military strategist Sun Zu, if you know the enemy and you know yourself, you will not be imperiled in hundreds of battles. Read Jamie Glazov's illuminating, well documented Jihadist Psychopath, and you'll learn how our beloved country arrived at this low point in its history, and how we can make it the light of the world again." – Lieutenant General Ion Mihai Pacepa, the highest-ranking official to have defected from the Soviet bloc. "Jamie Glazov's moral and intellectual incisiveness vis-a-vis the threats posed by totalitarian ideologies and by the invariably accommodating responses of many of their would-be victims in the West was forged early in life in the crucible of his family's confrontations with Soviet Communism. He brings that incisiveness to bear in this important, unflinching examination of today's onslaught against the West by Islamist forces. He addresses the psychological components of the attack and the psychopathology of the attackers, as well as the political and psychological dynamics behind the unilateral disarming of so many in the West, the acquiescence to and accommodation of the Islamist assault. Only by absorbing the messages of the book can the West hope to mount, finally, an effective response to the threats now confronting it." – Kenneth Levin, psychiatrist, historian and author of "The Oslo Syndrome: Delusions of People Under Siege"
"If you are a thinking person who values facts and desires a better understanding of terrorism, then this is the book for you. Refreshing new insights clearly laid out with exhaustive investigation, unambiguous evidence and rational conclusions. All of this wrapped up in a book that is hard to put down and just plain enjoyable to read." "This fascinating book needs to be applauded mightily. Jamie Glazov reveals how the Islamic Supremacists who seek to conquer our society employ the methodology of the psychopath. They play the pity card; they use charm and deceit: and they have their victim in their grips, they move in for the kill. Their leftist allies, meanwhile, utilize Jihad Denial and moral equivalency to help the rat-infested plague ship to draw near. Read Jihadist Psychopath to learn how to identify the banners of this dire threat - and arise to join the fight for our civilization." – Kenneth R. Timmerman, author of "Shadow Warriors: Traitors, Saboteurs, and Party of Surrender"
"Jihadist Psychopath casts a critical eye on Islamic radicals' beguiling dance of death, which is luring so many victims into willing submission. This timely book shines a light on the mass psychology of those coming under the sway of jihadist intimidation. Moses-like, Dr. Glazov invites individuals, communities and nations to renounce beguiling lies, which can only lead to death, and instead to 'chose life; 'This day I call the heavens and the earth as witnesses against you that I have set before you life and death, blessings and curses. Now choose life...'. (Deuteronomy 30:19). – Mark Durie, author of "The Third Choice: Islam, Freedom, and Dhimmitude"
"Phenomenal. Jamie Glazov provides keen insights into the jihadi mindset with Jihadist Psychopath. Much of the global Islamic movements strategy for jihad hinges on the ignorance of the West regarding their doctrine and modus operandi. Jihadist Psychopath is the antidote for that ignorance the Islamic movement so desperately needs for victory. To say that this is recommended reading would be an understatement; Jihadist Psychopath is crucial reading if freedom is to survive." – Chris Gaubatz, co-author of "Muslim Mafia: Inside the Secret Underworld that's Conspiring to Islamize America"
"Jamie Glazov's Jihadist Psychopath should be required reading for every American and Westerner interested in saving our civilization. This book gives a dire warning about what is coming and contains monumental revelations that will shock and disturb you. Jihadist Psychopath should be studied carefully by all law enforcement and government officials of the West - as well as by everyone who values freedom."